As a recently qualified Diabetes Nurse Educator working towards Credentialling, I want to share my successful implementation of a hospital wide change of practice. Needle stick injuries (NSI) to Healthcare Workers (HCW) resulting from patients’ own pen delivery devices have six times the incidence rate compared with disposable syringes; placing significant human and financial burdens for the nurses involved and Health services as a whole1. The US and European Union governments have mandated the use of Safety Engineered Devices (SED’s) through guidelines, regulations and policy; this is yet to occur in Australia2. To successfully implement a change management initiative and hospital wide roll-out of an insulin safety pen needle. Overwhelmingly positive response to pilot trial of safety pen needle. Collaborative and supportive approach to hospital wide roll-out ensured initial resistance to change was managed, as supported by anecdotal evidence, ongoing evaluation continues. 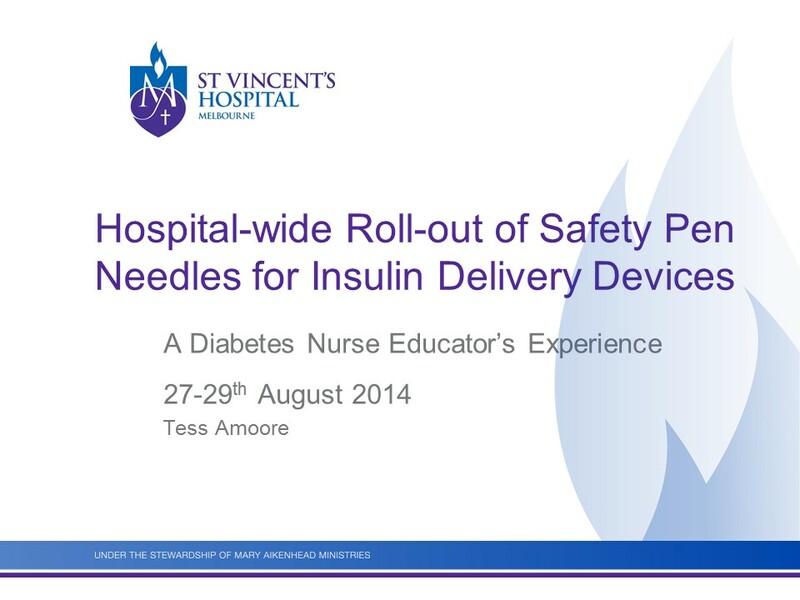 Hospital wide education and roll-out of a safety needle for insulin pen devices was successfully implemented following a collaborative approach. Evaluation of safety needle use is ongoing via monitoring of risk reporting. 1. Pellissier, G., Migueres, B., Tarantola, A., Abiteboul, D., Lolom, I., Bouvet, E., the GERES Group. (2006) Risk of needlestick injuries by injection pens. Journal of Hospital Infection 63, 60-64. This abstract award is supported by Roche.